Consumer electronics retailer Best Buy wants to be the big dog of videogame retail, and it wants to hire dedicated gaming employees to do just that. For those not familiar with North American retailer Best Buy (though I hear they have a few shops in China, Turkey and the UK), it sells a ton of electronics. MP3 players, digital cameras, computer stuff - and yes, videogames. But the games have always seemed like an afterthought; just something you put next to the DVDs and CDs to make the store seem well-rounded. That's going to change. 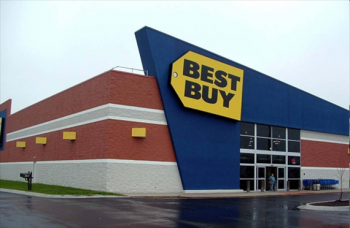 According to Gamasutra, Best Buy plans on adding dedicated in-store checkout desks and sales clerks devoted solely to the videogame section in a bid to overtake GameStop and Walmart as North America's leading game retailer. Best Buy is currently in third place. Best Buy plans on hiring "dedicated, informed, and engaged employees focused only on gaming," senior VP Chris Homeister said in a presentation. Like at GameStop, the Best Buy employees will encourage the purchase of preordered games and later DLC. Also like at GameStop, Best Buy plans to drive sales of new products by offering trade-in credits for preowned games that people don't want anymore. However, to help separate itself from the inevitable criticism that Best Buy simply plans to open miniature GameStops in its stores nationwide, Homeister said that game trade-in credit could be used "for any category of products" in the store. Considering how much stuff is at your average Best Buy, that may not be all that awful a deal, thinking about it. Still, it's a bit disappointing since I was just about to make that joke, too. Best Buy's increased emphasis on gaming will be at the expense of its music department, which will be given less space on the store floor to make up for all of those new copies of Call of Duty.